Reach more accurate conclusions when analyzing complex relationships using univariate and multivariate modeling techniques. Describe the relationship between a dependent variable and a set of independent variables. Use flexible design and contrast options to estimate means and variances and test and predict means. 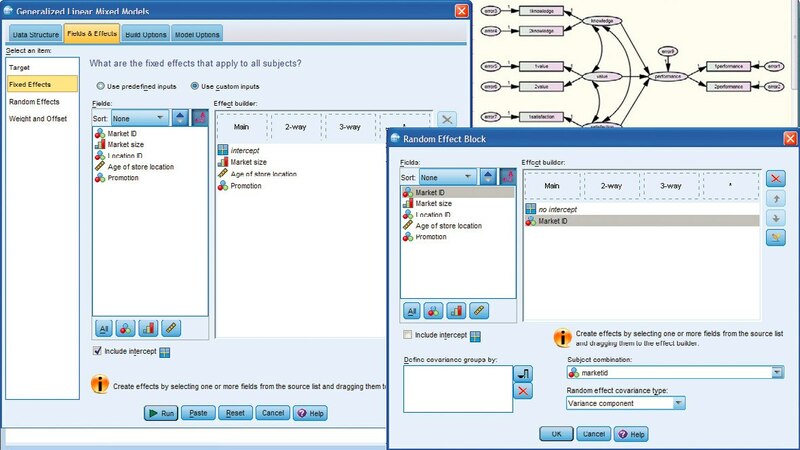 Mix and match categorical and continuous predictors to build models. Use linear mixed models for greater accuracy when predicting nonlinear outcomes. Formulate dozens of models, including split-plot design, multi-level models with fixed-effects covariance and randomized complete blocks design. Provide a unifying framework that includes classical linear models with normally distributed dependent variables, logistic and probit models for binary data, and loglinear models for count data—as well as various other nonstandard regression-type models. Apply many useful general statistical models, including ordinal regression, Tweedie regression, Poisson regression, Gamma regression and negative binomial regression. Model means, variances and covariances in data that display correlation and non-constant variability. Formulate dozens of models, including split-plot design, multi-level models with fixed-effects covariance and randomized complete blocks design. Select from 11 non-spatial covariance types. Improve accuracy with repeated measures data, including situations in which there are different numbers of repeated measurements, different intervals for different cases or both. Extend generalized linear models to accommodate correlated longitudinal data and clustered data. Model correlations within subjects. Access, manage and analyze virtually any kind of data set including survey data, corporate databases or data downloaded from the web. Run the GLMM procedure with ordinal values to build more accurate models when predicting nonlinear outcomes such as whether a customer’s satisfaction level will fall under the low, medium or high category. Choose from a flexible and comprehensive set of techniques for understanding terminal events such as part failure, death or survival rates. Use Kaplan-Meier estimations to gauge the length of time to an event. Select Cox regression to perform proportional hazard regression with time-to-response or duration response as the dependent variable. IBM SPSS Advanced Statistics requires a valid IBM SPSS Statistics Base license.